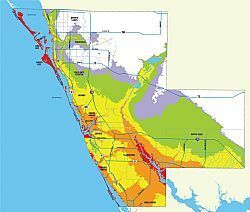 SARASOTA COUNTY – Sarasota County is hosting six open houses starting Monday, June 20, to address changes to FEMA floodplain maps, which take effect Nov. 4. The open houses, which will be held in multiple locations and feature staff members from both the county and the municipalities, are an opportunity to ask questions about potential changes to the flood zone. The digitized flood maps are now available and can indicate whether properties' flood risk has changed. If there's a risk zone changed, flood insurance may be required by homeowner's lender when the new flood maps become effective on Nov. 4. June 20, Venice Community Center, 326 Nokomis Ave., Venice. June 21, Englewood Sports Complex, 1300 S. River Road, Englewood. June 23, Morgan Family Community Center, 6207 W. Price Blvd., North Port. June 27, Southgate Community Center, 3145 Southgate Circle, Sarasota. June 28, Nokomis Community Park, 234 Nippino Trail E., Nokomis. June 29, Sarasota Municipal Auditorium, 801 N. Tamiami Trail, Sarasota. To view individual property parcels, visit www.scgov.net/floodmaps.